My breasts and I turned forty this last year. Generally, we are pretty happy about it. I've got stray grays and I hope my thinning scalp means that the rest of my body hair is thinking about letting itself go as well. Aside from my body, I know what I want to be when I grow up. I started graduate school. My kids have reminded me that laughing like I did at 8, 10, and 12 is the best thing about living. But my breasts and I, we have other concerns. I got my first mammogram a few months ago. That's something that you have to add to your well-being checklist when you turn forty. Breast health, being on the look out for dodgy menstrual cycles, and last ditch efforts by your ovaries to trick you into having twins or triplets. ("These eggs aren't getting any more viable," your ovaries say to you, "so whaddya say we make a half dozen babies RIGHT NOW?") So you track your period more closely, wonder when you'll start having hot flashes, and worry, if only a little, about breast cancer. I'm worried, if only a little, about breast cancer. For one thing, I don't know a single woman over the age of forty (though younger women and men certainly get breast cancer, too!) who doesn't have or isn't directly related to or friendly with one other woman who has or has had or is dying from or has died from breast cancer. I worship with breast cancer survivors. I know women who are dying from metastatic breast cancer as I type this very essay. And as of three months ago, I know that I have a small spot in my left breast that my doctors want to keep an eye on. For women, breast cancer is always a lingering at our annual checkups. And for women who get metastatic breast cancer, death follows. In fact, 40,000 deaths a year in the United States, over 500,000 worldwide. Metastatic breast cancer is currently incurable. You get it, you die. And men get it, too. It's not a pink ribbon problem, it's a human problem. It's not a loss of your breasts/femininity problem, it's an end-of-life problem. That's the statistic that lingers in my mind, the worried mind that perks up a few minutes before I fall asleep and reminds me that I have a small spot in my left breast that my doctors want to keep an eye on. In another three months I'll go back for a repeat scan to see if that spot is a problem, or just some dense breast tissue. That's three more months of seeing the specter of breast cancer out of the corner of my eye. Am I worried? Not really. I got my screening, I will keep up on regular doctor's appointments and mammograms, and I know both from research and anecdotal stories from other friends that breast imaging is sometimes sensitive to the point of (appropriate) hyper-detection. But am I carefree? Not really. Because whether I will someday have breast cancer, and whether that will someday metastasize, I can't say. But I am certain that I will continue to know and love people who do get breast cancer, and who do die from it. So, in the meantime, I do the only reasonable thing I can. These cupcakes. Which I made this morning and have already eaten two. Because Bake It Happen asked me to support their campaign to raise awareness. Not the pink-everything, ribbon-wearing awareness. That campaign seems, however in earnest it may be, to have taught us that breast cancer is only a pink problem (i.e., woman's problem), that it's curable, that it's not big deal, this it's just a bump in the breast. 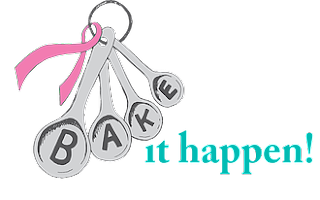 Bake It Happen is raising awareness for life-ending metastatic breast cancer. 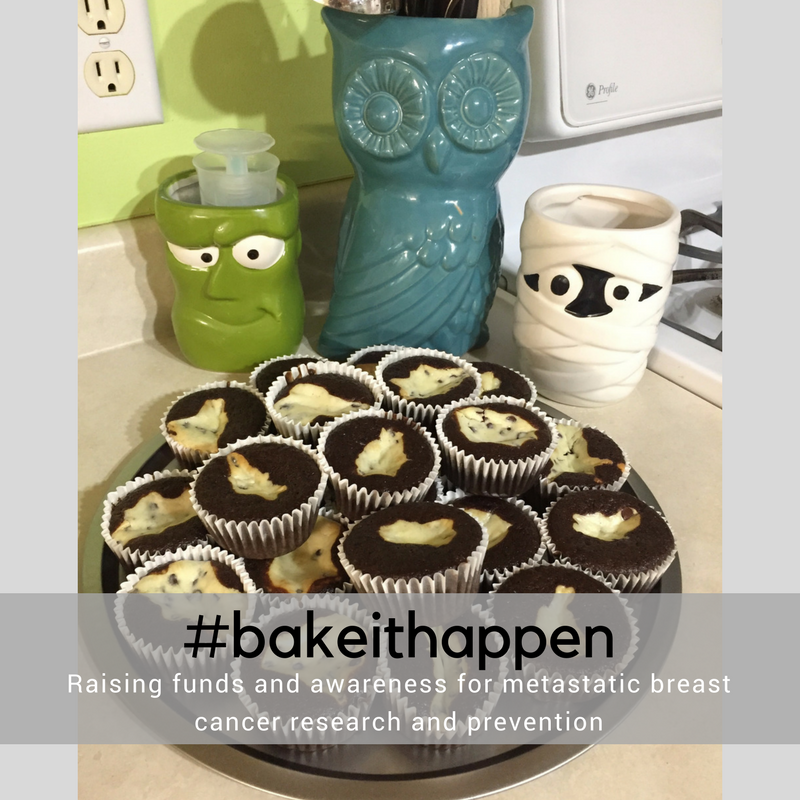 And this month, every time someone bakes and shares a photo of the Bake It Happen baked goods, money goes directly to The Cancer Couch, which gives 100% of the money it raises to metastatic breast cancer research at Memorial Sloan Kettering Cancer Center and the Dana-Farber Cancer Institute. In other words, I have to eat "Judy's Black Bottom Cupcakes" so that people won't die, if not today's patients, then future metastatic breast cancer patients. People like Beth Caldwell, like Rebecca Timlin-Scalera, and like Judy Levin, whose cupcake recipe I'm currently enjoying. 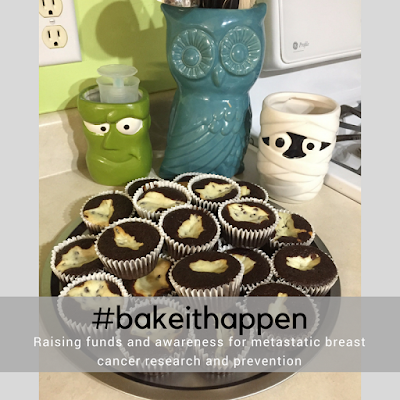 You can help, too, by either visiting Bake It Happen and making and sharing pictures of what you bake or donating directly. Why? Because chances are you like delicious things, and chances are that you or someone you love will be diagnosed with breast cancer. That's reason enough. 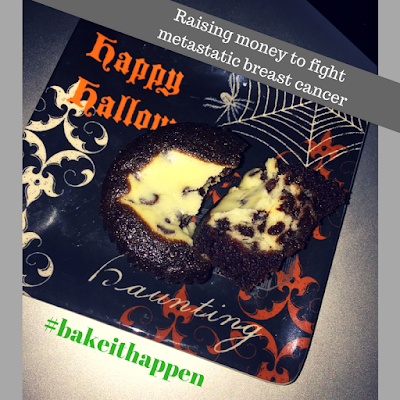 Visit Bake It Happen to get the recipes, or donate here. You can also visit The Cancer Couch, to which all this month's Bake It Happen fundraising will go. And visit Beth Caldwell's blog, she's dying and she's lovely and you should read about her even if it's hard. Chris is a wonderful stay-at-home mom. He's also a man. So, when Luvs asked me to pick a dad I could honor for Father's Day, I choose Chris over my own husband or father, because, frankly, Chris has a swimming pool at his house and frequently invites my kids over. With the $200 Luvs gave me to celebrate a special father, I donated $150 in Chris's name to Little Wish Foundation, a local charity that serves "pediatric oncology patients by providing a little wish that brings hope, comfort." Luvs also gave me some of their top-quality diapers (always my favorite leak-stopping brand to use on my kids), which I donated to another local group, SCAN (Stop Child Abuse and Neglect). The other $50 I spent on over one hundred snack packs. Now when my kids eat his stash of kid food, I will feel like a hero. Look how happy this made my friend. Why? Because in that giant bag (one of two) there are packs of mini Oreos. Another reason we all love Chris around here is that Chris is our block's primary bus stop monitor. My kids safely made it to school because Chris is a better, more concerned parent than I am. I should feel shame, but my always piping hot coffee that I enjoy at my kitchen table every morning while he ushers the neighborhood school kids onto the bus, drowns out my bad feelings. All of this is to say that Chris, a stay-at-home dad of three kids ages 5 to 10, is a better mother than I am. I mean "mother" in the way that when I say "the parent who stays home" most of us immediately bring to mind the image of a woman in yoga pants pushing a stroller through the grocery store. What makes Chris such a great stay-at-home-parent? Does he like yoga pants? Will he share his new stash of kid snacks with me? I wanted to find out, so I interviewed him. N: Did you decide to be a stay-at-home-dad or did you lose (whoops, I mean "win") a bet? C: My wife and I talked about it before we got married. Both of our values were that we thought it would be beneficial if one parent was home. We said, well, you’re a doctor [Chris's wife], I’m a restaurant manager. Actually, with our schedules, no one would be home. I like to be very involved, to be there all the time. N: I found the whole staying home thing to be a big deal, all caps. MOTHER. Like, if I didn't choose to stay home I was choosing to be selfish. Would you have felt guilty if you had said, "Nah, I don’t want to stay home with them"? C: I guess I had a job, as opposed to a career that I really loved. 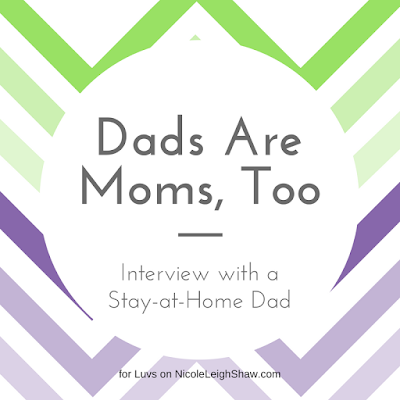 So, if it were something else, if I had gone a different path occupationally, maybe I would have had a pull toward work and had felt guilty for not choosing to be home with the kids. But I’m pretty practical. I think I understand that it is probably better to have a little guilt for working than to have animosity over having to stay home. N: Did you also think about what kind of parent to be? I did. I think a lot of moms I know do. Like, will we only eat organic, pre-school or not, homeschool, rinse off dropped pacifiers, co-sleep, baby wear, formula? Well, I guess you didn't have to decide between breast of bottle. C: Yeah, I never did lactate. But for the rest? I never really thought about that. My wife and I are both very laid back, low-key people. “Don’t eat this baby food because . . .” We never really went crazy about that. Love is probably—well, it is the more important thing. N: All you need is love, roger that. Now let's talk sexism! Do people always ask you if your kids' mom is available instead of you, kind of like when the roving roofing guy rings my doorbell and asks to speak to my husband instead of me? C: The biggest one I get, it’s usually women cashing me out at the store, who say, “That’s so nice, giving mom the day off.” I’m like, no, I am the mom. N: Well, you're almost the mom. You're just missing the yoga pants. Do those comments bother you? C: It didn’t at first. I was a new parent. I didn’t know any better and my parents both worked. After a while it got annoying, like, “Oh, is it your day off?” No, it's my life. N: Do they ever assume you're a single dad? C: I think the people at church think so. [laughs] Because my wife is usually at work or sleeping after a night shift in the ER. It can be a little awkward at playgrounds and school meet ups and playdates—it can be a little uncomfortable. N: I think I know what you're saying, but don’t want to guess. C: Well, it’s being a male in a predominantly female community. It’s like that at the kids' swim practice and meets, for example, it’s more women. I'm pretty hypersensitive about projecting what I think somebody else is thinking about me. I’ll think, “Well, I didn’t say hi and they probably think I’m just a creep watching little kids swim.” But I’d say over the past year, it’s gotten better, finally. But I generally have a hard time introducing myself, actually, so that plays into it, too. N: What do your family and friends think about your stay-at-home parenting? C: Family-wise, I never got any inkling that they had a bad opinion of it. I knew they were not just okay with it, but in support. The only thing I will say, if there is any time I get any kind of crap about it it’s from other men. Most of the time it’s from complete strangers. N: Yeah, men are the worst. (I'm kidding!) What do they say? C: The one that I get the most is “Wow, you got the life.” And I’m like, yeah, I do, but not for the reason you think. N: Do women give you trouble? Women are the worst (also kidding). C: There are a lot of times I have felt excluded. It’s just weird. There are times when. Okay, it’s more difficult because of my wife's job. She’s home a lot, but on an irregular schedule. It’s kind of difficult because she’ll get invitations to do whatever, but then she’ll say she has to work and there it ends. They don't say to me, "Okay, how about you come, Chris?" N: That would grate on me. C: Well, I get it. I don’t think it’s intentional. Sometimes there are things that go on that, if my wife were home, my kids would participate in, but because it’s just me, it doesn’t happen. N: Do you have stay-at-home-dad friends? C: There was actually a dad’s group I went to a little. Now, here’s the anti-social part of me who's not that into it. It took me almost a year to go. It was okay. It was alright! [laughing] It was great, had a good time just meeting these guys, but it’s just me being me, I wasn’t into it. I’m not missing the social aspect for me. I’m more concerned about missing the social aspect for the kids. N: I need parent friends. They help me feel like I'm not losing my mind, or that all the million things that need doing, that I worry about, they understand it. The mental load of raising kids is tough. "Who has to be registered for what sport, how much is the school trip, do we have any clean underwear?" Know what I mean? C: I do, sometimes! The mental load is mostly around the schedule or when my wife's sleeping during the day. Trying to keep the house quiet. Or getting to all the events in a week. Making sure whatever has to be done gets done and trying not to forget things. But I think my wife and I are both pretty keyed in to what needs to be done. I have a tendency to try and do things and not ask for help, like, no, I got this. N: Yessssss. This is the stay-at-home-parent mind. Why? C: I think because I’m a stay-at-home dad I have a little guilt because I’m home and I don’t have a "real job." Along with that comes, "Well, I’m raising kids, but am I doing enough?" Like kids ask to play games with me and I’m like “this laundry’s not going to fold itself.” Or all the stuff a "normal" dad does, like mow the lawn and change lightbulbs and unclog drains. N: But you do mow the lawns, I see you! And I have an outside-the-house job and buy the gorceries. There are no rules! Parenting anarchy! Subvert the system! Etc.! Let's talk Father’s Day. Is it a no big deal holiday? Mother's Day feels like a Big Deal, even if I don't want it to be. What's your version of an ideal Father's Day? C: Honestly, I don’t know. I don't want to go to lunch or dinner where everyone else is going and it's crowed and no fun, so why bother? I don't need a big celebration. It’s an identity thing. Maybe Father’s Day would be a bigger thing for dads who work outside the house and have to budget their time with their kids. Because they maybe they don’t have as much time with their kids. I think maybe moms feel this, too. Like, I’m with them all the time. I don’t need this special event. N: Because when you're a stay-at-home dad, everyday is Father's Day! Right? Kind of? Well, Happy Father's Day, Chris. And thanks for letting me sit in your air-conditioned house while my kids swim with yours in the pool. This is the kind of parenting I signed up for. If you are a stay-at-home, work-at-home, work-at-an-office, breakfast-for-dinner, let's-play-catch, any-kind-of-dad Dad, you might want to download these Luvs coupons. 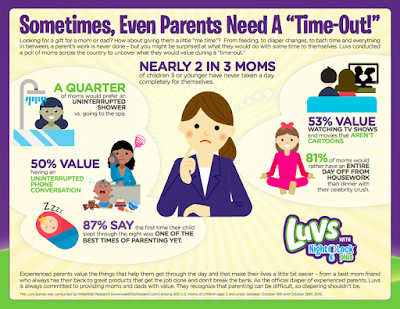 Luvs, the official diaper of experienced parents is sharing the luv this Father’s Day and offering a great money-saving opportunity with a $2 print-at- home coupon. Visit http://www.coupons.com/brands/luvs-coupons/ to access a Luvs coupon of $2 off any one diaper pack. Print-at- Home coupons expire 30 days from the date the coupon is printed by the consumer. You can use this coupon at any mass, discount or grocery stores where Luvs Diapers are sold. All Luvs Diapers are included in this particular offer, except trial/travel sized diaper packs. As the official diaper of experienced parents, Luvs is always committed to providing dads and moms with value. They recognize that parenting can be difficult, so diapering shouldn’t be. ATTENTION: Luvs sponsored this post, but Chris is my real-life friend and these are my actual opinions. Now get out of here, I have a playdate at Chris's house and I want to get there before the good snacks are gone. *This post is sponsored by Luvs. It comes as a surprise. It's happened more than once and still, it shocks me a little, pricks at the corner of my eyes. It catches in my chest the way all the best feelings do, the ones that barrel into my consciousness, expanding out from my heart in a blink, filling my entire being with attention and awareness. In the first moment, it's awesome. In the next it's awful because I know what it is and I know that I didn't ask for it but I don't know what I'd do if it left me. It's love plain and simple and powerful. It's syrupy so that when the heat of it finally burns off I feel a little silly about it all. I feel like everyone who was not a part of what I just experienced can see it on me, a residue of intimacy, a sticky aura that makes me both an object to smile at, indulgently, and at the same time someone to giggle at, just a little. Was I really just overcome with emotion? Have I no control over my feelings? Love is not the place at which mothers come to rest. Love happens to us. And love is the thing, the thing above all else, that makes us mothers. That's the magic of it. You can birth your baby or adopt your baby or lose and mourn and bury your baby. That's not what makes you a mother. What makes you a mother, the single thing that legitimizes you for all time, is the unexpected, unbidden, here in a white hot flash love that steals upon you from the inside out. Some of us feel it when we look into our babies' faces and cannot for the life of us look away. Some of us feel it when we sign the final line on adoption papers and say to the child our hearts knew we needed, "we are home now, we are your home, it's us." Some of us feel it in the excruciating pain of the baby we had started to love before we even named it, the baby we won't hold, or that we only get to hold for too short a time. In that terrible darkness we realize the tiny light in the distance is love, unexpected, unbidden love. A mother's love is not limited to an outward sign. It's not a bugling belly or a toddler in hand or a cross hanging from our necks, a small reminder of a child we held in blessed arms, invisible hands that in our heart and souls. But it's also not limited to our own children. When we are teachers and confidantes, protectors and coaches of people we come to care about in such a way that their value is immeasurable to us, their safety important, their joy our laughter, their sorrows our tears, those, too are our children. They might be students or neighborhood kids, nieces or nephews, grandchildren or any number of small people we meet and grow close with. We can't know when they will become our children, too, when we will recognize that we are also their mother, even if they already have one. But loves knows. And unbidden, unexpected, it blooms hot and wild in our chest and then we understand what it means to be the mother to a child. It means to have love visit us, sticky and sweet and binding, and to hold us so that we feel awed and awful, amazed by the gift of it and scared of the weight of it. We'd eat it up, we love it so. This Mother's Day, let go of the false idols and myths of motherhood. Let go of guilt or shame. Let go of infertility, loss, disappointment. Let go of overbearing pride. Let go of the image you've been holding yourself to, the one of the mother who is everything, always, to all of her children. Let go of trying to control and contrive motherhood. And let yourself know and rest in the knowledge that you don't become a mother, motherhood comes to you, a flame in your very core that tests you and proves you, like precious metal in a fire, and connects you in the most special way to a precious child. 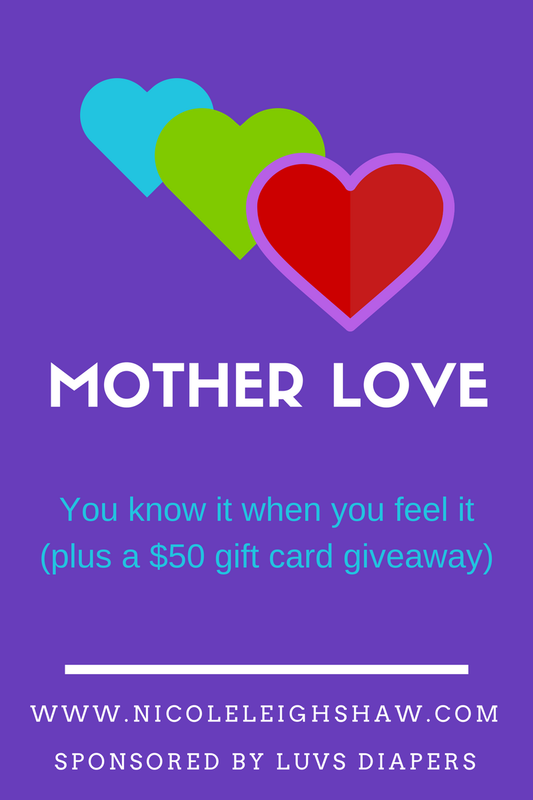 It's mother love and it's magic and it's what we all want most for Mother's Day. Happy Mother's Day from me and Luvs diapers. For years now I've been working with them to spread love and joy to parents who have been in the trenches and have lived to tell about it. We are usually veteran parents, we Luvs lovers, who are less fussy about sterilizing the pacifier after it drops to the floor for the millionth time, and more fussy about seeing our second (or third or fourth or . . .) kid off to preschool for the first time because we know now that it's not about capturing a great picture for Instagram, it's about showing up in case that fluttery, hot feeling bubbles up on our hearts and, embarrassingly, flows out of our eyes. It's okay, we don't mind crying in public now, we understand that those are the best moments. 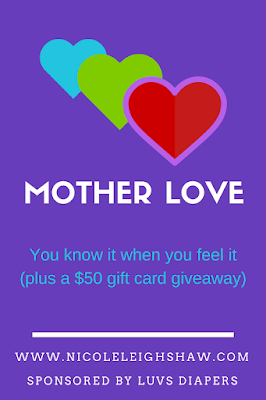 So, to celebrate this wonderful love, Luvs would like to give one of my readers a $50 gift card. Just enter with the Rafflecopter below. Contest ends at 12 am on 5/16/17. Even if you don't win, you can get a coupon for $1 off of any one diaper pack of Luvs with NightLock. In honor of Mother’s Day, Luvs, the official diaper of experienced moms (and dads, too) is sharing the luv and offering a great money-saving opportunity with a $1 print-at- home coupon. o Visit http://www.coupons.com/brands/luvs-coupons/ to access a Luvs coupon of $1 off any one diaperpack. o Print-at- Home coupons expire 30 days from the date the coupon is printed by the consumer. The official diaper of experienced parents, Luvs Ultra Leakguard Diapers with NightLock Plus™ are softer and more absorbent than before, with large stretch tabs for easy fastening, ultra-leakage protection and a money-back guarantee. Luvs provides features babies and parents need for less cost than premium brands. *This post is sponsored by Luvs, the pay me to write about motherhood, the good, the bad, the stinky, and the sentimental. I agree to it because I really, really like their diapers---I used them on my own kids. All opinions are my own. This post is sponsored by Luvs, who compensates me for my posts. The benefits of preschool aren't always obvious. I mean, how many scribbly drawings can you "save" in the "circular file"? But if you're lucky enough to have access to a play-based preschool, your kid will learn about self-regulating behaviors, group work, personal management, and peer relationships—all while also learning ABCs and 123s. They will all that learning while getting dirty, running on playgrounds, and singing loudly (and, let's be honest, badly) in the classroom while sitting criss-cross applesauce. Me: "My son is doing really well in kindergarten this year. Somehow he learned to read, I guess. I mean, I didn't teach him, he's my fourth kid, ain't no momma got time for that. Hmmm, I wonder where he learned to read..."
Preschool Director: "Do you think he learned it here, Nikki? 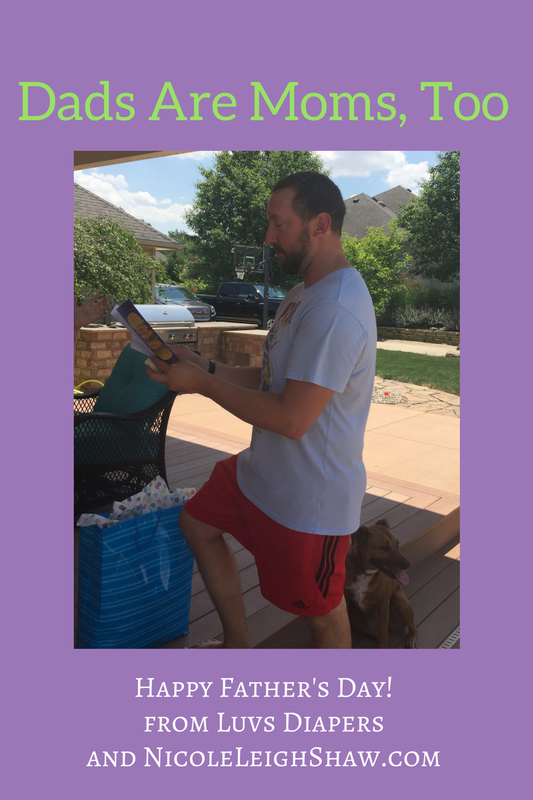 You know, at the preschool that you sent him to for three years where we read everyday and worked on the skills he'd need to become an independent learner?" That's score one for preschool, zero for mom of fourth kid who barely remembers his name. Scooter? Buddy? Well, it'll come to me. But the point is that my son, as well as his older sisters, soaked up so many lessons so seamlessly from their preschool teachers that we barely noticed what was happening. And all of that is down to the women (and men, from time to time), most of them parents themselves, who treat their preschool teaching jobs as a calling, not just a paycheck. These women work overtime, without pay, because they are invested in other people's kids. Who do you think constructed that pop-up flower cart for a Valentine's unit on commerce through which your kid can play the part of the flower shop owner or the customer, all using paper play money and flowers they worked all week to create from coffee filters and pipe cleaners? Their preschool teacher, that's who. These women give their tears, time, and talent to other people's kids because they love them, too. Who else is willing to cuddle with your kid at story time, even though he's got a snotty nose working overtime? Their preschool teacher, that's who. These women teach writing, grouping, letter recognition, good sportsmanship, and to wash hands after going to the bathroom or before eating. They take toddlers on nature walks and let four-year-olds play with the messy stuff that mom and dad try to avoid at home. Sand, paint, water? Preschool teacher's aren't afraid of a big mess. They understand three-year-old-talk and have bad knees from squatting so they can look little people in the eye when they speak. They laugh when our kids laugh and cry when our kids cry. They give out hugs and kiss booboos and dust our kids off when they fall. Preschool teachers do all that for love, not money. But that's not all. THEY EVEN CHANGE DIAPERS. I mean, poopy diapers, over-filled diapers, I-eat-solid-foods-now diapers. Here's to the fearless and fiercely devoted preschool teachers of the world. They have a finger paint handprint on the thigh of their pants and something gooey in their hair, and it looks good on them. 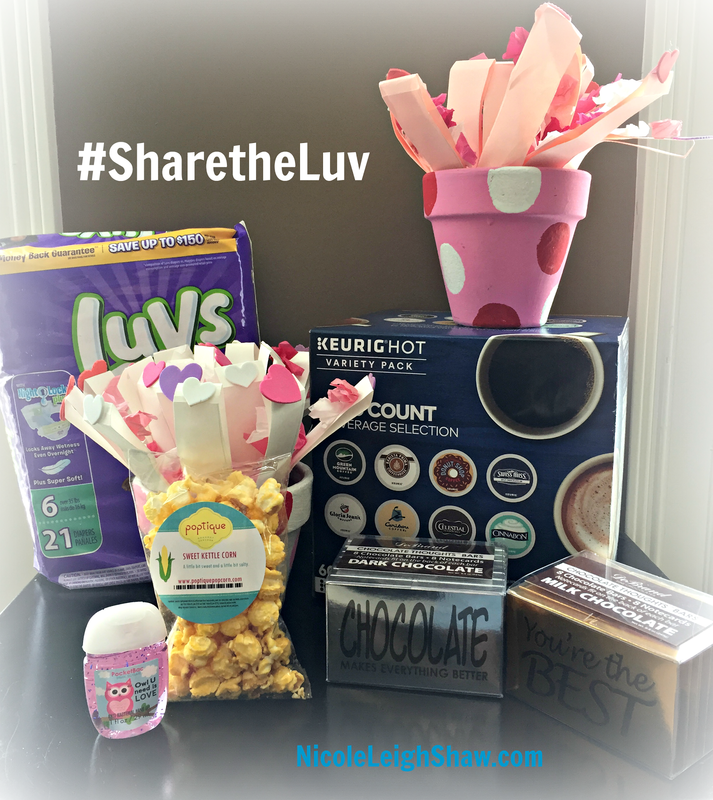 Luvs asked me, as part of their Luvs MVPs (Most Valuable Parents), to #ShareTheLuv with some important moms this Valentine's Day. I asked them, "What if I share it with over a dozen preschool teachers who helped my kids to grow and learn over the last seven years?" No surprise, they Luved the idea. With some American Express gift cards (supplied by Luvs) I set out to shower over one dozen women with tokens of my appreciation. What does a hard working preschool teacher need . . . I solemnly swear to give these things to the preschool teachers instead of keeping them for myself. Even though I am also my Valentine. COFFEE. Our preschool teachers and staff recently chipped in for a Keurig. So I'm stocking it up with an assortment of post-playground pick me ups. CHOCOLATE. A bunch of chocolate bars (that's right, BARS) to help the coffee and tea go down? Check. TREATS. Sweet kettle corn snacks that the teachers don't have to share with their class. HAND SANITIZER. Kids are pretty germy, snotty, and generally gross (in the cutest paossible way). And no matter how good Luvs Ultra Leakguard Diapers with NightLock Plus™ are at containing leaks, every teacher needs appreciates some hand sanitizer after a particularly intense diaper change. LUVS. Thanks to my friends at Luvs, our two-year-old classroom will now be stocked with 10 packs of size 6 Luvs Ultra Leakguard Diapers with NightLock Plus™. I know this isn't enough. How can I ever really thank these people for loving my kids, even on the tough days and rough days when there were stubborn refusals to share and anxious tears as I waved goodbye? 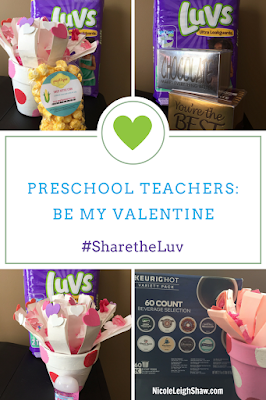 In a world of small moments that make parenting go more smoothly, the love of a preschool teacher for your child ranks among the best of them. And, if you're very lucky, they will even help your pre-k kiddo learn to read. This Valentine's take a minute to share some gratitude for the moms in your life. Luvs is encouraging parents to “Share the Luv” this February with fellow deserving parents. Also—to make sure everyone gets to share in the Luv—Luvs is offering a great money-saving opportunity with a $1 print-at- home coupon. The "plus" is not having to change the crib sheets when you go in to change the baby's diaper in the morning. 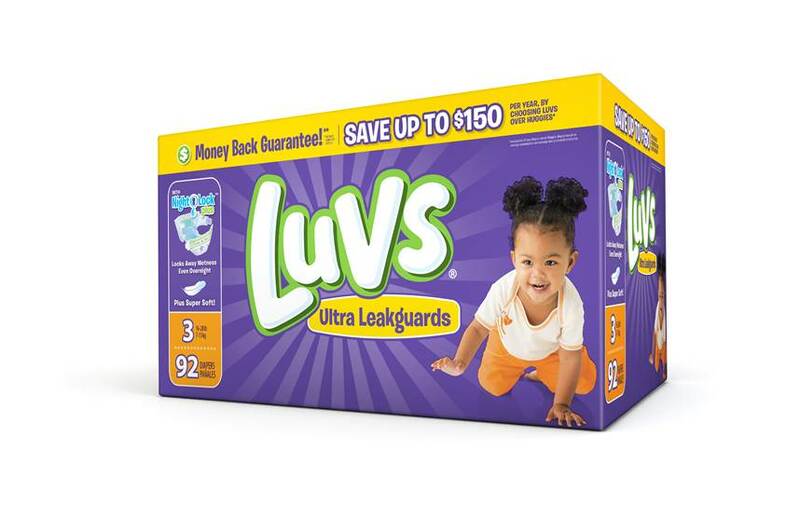 Visit http://www.coupons.com/brands/luvs-coupons/ to access a Luvs coupon of $1 off any one diaper pack. Print the coupon at home and use it at any mass, discount or grocery stores where Luvs Diapers are sold. This is a sponsored post, but the opinions are all mine. And my opinion is that Luvs diapers are a premium product with a budget-friendly price. I used them on my kids long before I began working with the Luvs brand. Let's give thanks for the little (like, tiny teeny) things! It's Thanksgiving. Cue the #thankful lists on social media. Everyone loves to talk about what they are grateful for, what they love, what they value in life. And that's great. Except sometimes it feels like other people are giving thanks for finally learning to play the harp or a kid who got into college at age 13, when the rest of us are just happy we remembered to pick up the canned cranberry sauce. You know what? You be thankful for that cylinder of fuchsia jelly. When you've been around the parenting scene for long enough, you know the little things add up to a big ball of grateful. You're thinking, "But it's Thanksgiving and it feels big and important and shouldn't I be thankful for health and family and 27 people coming to my house for turkey and pie?" Look deep into your heart. If you had your choice, you'd send everyone out for chicken nuggets on Thursday if it meant you could have 5 minutes just to brush your top teeth and your bottom teeth all in one go without one of your children needing help blowing their nose. That is the big stuff. That's worth a hearty "Thanks!" Luvs surveyed a group of moms and guess what? We are all counting the little blessings. In fact, we kind of prefer it that way. According to a survey Luvs conducted, we parents would rather shower in peace than have a hot stone massage. Check out this infographic, which basically says that moms would value a full-sized candy bar they can eat while hiding in the trunk of their minivans. That's what they value. What can we learn from the fact that nearly 2 in 3 moms have never taken a day completely for themselves? We can learn that we will take small doses of added value anyway we can get it. Also that we should really make an effort to find a good sitter. 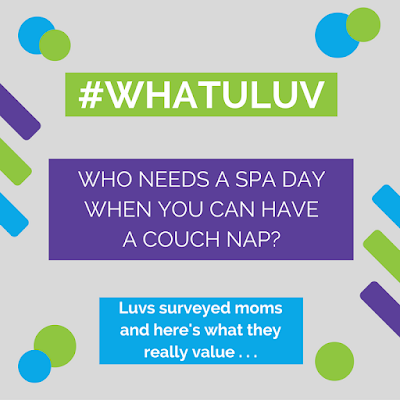 Luvs discovered that small kindnesses are #WhatULuv. Lean in sister moms and brother dads, here’s more of what we love, of what we value most. Not the pie-in-the-sky stuff of fairytales, but the little victories that get us through the day. We love hot meals, eaten alone. Even if we have to eat them while hiding in our closets. We love babies who can be lulled to sleep by a short car ride. We love it when our kids sneeze into their elbows and not our faces. We love toddlers who can feed themselves. We love baby's first full night of sleep after which we remember that sometimes the sun rises before we do. We love when baby sleeps through the night and stays dry in her Luvs Ultra Leakguard with NightLock Plus. We love finding that one crayon in the wash before we accidentally slip it into the dryer. We love babies who are good burpers. We love kids who think leftover night is the best. We love clearance rack, wash-n'-wear tee shirts in patterns that mask baby spit-up. We love when Grandma sends holiday-themed outfits for our infants and they actually fit in the season in which they were intended to be worn. We love Luvs diapers because they are softer and more absorbent than ever, don’t leak, and don’t cut into our secret snacks budget. We love it when we can get the baby through the grocery store in same outfit they left the house in. We love washable art supplies. We love the official diaper of experienced parents who can leave the house with two kids and less than 576 things in the diaper bag. We love 5-minute couch naps while the toddler finishes watching cartoons. We love surviving to see another day full of giggles and minor mishaps and cuddles and creative parenting. So, this Thanksgiving enjoy #WhatULuv. Do yourself a solid and put an extra jar of store-bought gravy in the saucepan because who cares if the turkey is a little dry when you can drown it in gravy? The time you save not making homemade gravy will give you time to wash and dry your hair before guests arrive. Besides, everyone came for the carbs, not the protein. And before you go and finish doing all of the things and doing them like a boss, let me invite you to something that will make your life a little easier and more fun. Join a bunch of experienced moms for a #WhatULuv Twitter party hosted by @iConnect and @Luvs, on November 29th, 9-10pm EST to share what you value as a parent. There are sure to be prizes and laughs and you can come in your PJs. BUT THERE’S MORE: Download this print-at-home coupon and save $1 on Luvs diapers. SPONSORED POST ALERT: Happy Thanksgiving from me and my friends at Luvs, who sponsored this post. Yep, I get paid to talk about Luvs, but I talk about Luvs because I’m a Luvs mom. I have four kids and when they were still in diapers, they were in Luvs.